Check out what real members have to say! The next Body Buster Program in Langley and South Surrey Starts July 2nd! Try This At Home: Green Smoothie! Body Buster Die Hard Smoothie! Use frozen spinach for a colder drink! Use a tablespoon of Hemp oil or Flax oil to add essential fatty acids! 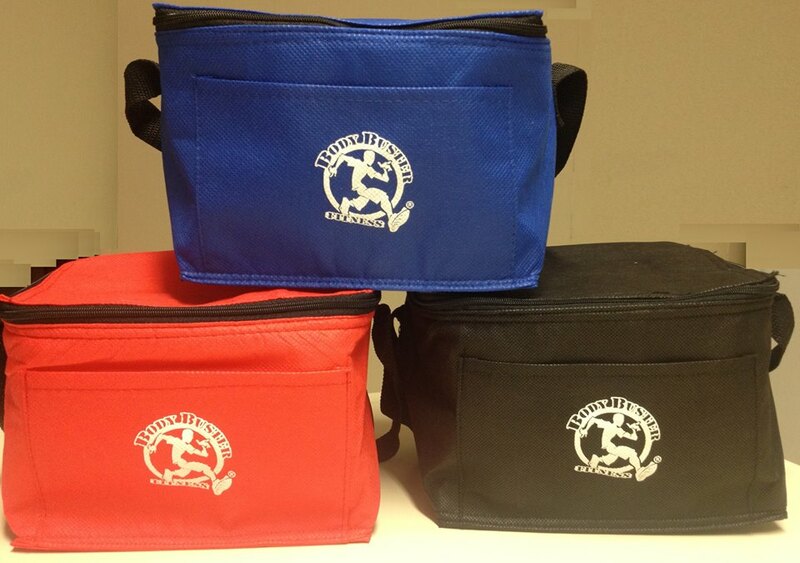 Register for the July 2nd Program before June 21st at 11:59pm and receive a FREE Body Buster Cooler Bag! INVEST IN YOURSELF AND REGISTER TODAY! An exercise we all love to hate...The Burpee! Start in squat position with your hands on the floor in front of you. Kick your feet back into a pushup position. Immediately jump your feet back in to squat position. Jump up as high as possible from your squat position. 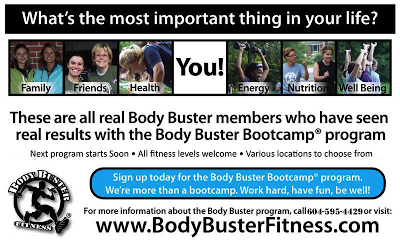 Body Buster Fitness Bootcamp...Discover what everyone is talking about! I started Body Buster 8 weeks ago because I felt that my own self-directed exercise wasn't cutting it. I didn't push myself and I wasn't seeing any results. It has also been a difficult and mentally intense time in my career, and I realized I needed something to focus on that would help me cultivate discipline and energy. What I like the most about Body Buster is that I get into what my instructor Kim calls "the fitness zone," in which I really dedicate my time to pushing my limits. I never leave class feeling any less than accomplished and proud. I was also pretty excited to see I had lost 1 inch from my bicep after 4 weeks! I donate blood regularly, and so I have my blood pressure and beats per minute measured frequently. At my last appointment, my beats per minute had gone down by 10! I know my cardiovascular health has improved. That being said, I do not pay too much attention to the numbers aspect of health and fitness. I focus on my everyday experiences and my physical and emotional well being. Since starting the program, I have more energy, I am happier and happier with myself, and I find every day activities like carrying groceries much easier! But for me, the most important thing I have gained is a transformation in my perception of myself. I have never, ever considered myself athletic and have always struggled to feel confident doing any kind of sports. I've also had bad experiences in the past with competitive sports and the judgements of others. But with Body Buster, I'm seeing myself as a *fit* person, and that is an incredible feeling. I believe Body Buster is noncompetitive and a safe place for people of all body types and fitness levels to explore their fitness. I'm sure there are a lot of people like me who struggle to see themselves as anything but unathletic, and Body Buster could be a sea change for them like it was for me. I'm continuing the Body Buster program because I feel really awesome about myself overall by participating. The Best Fitness Bootcamps in South Surrey and Langley! 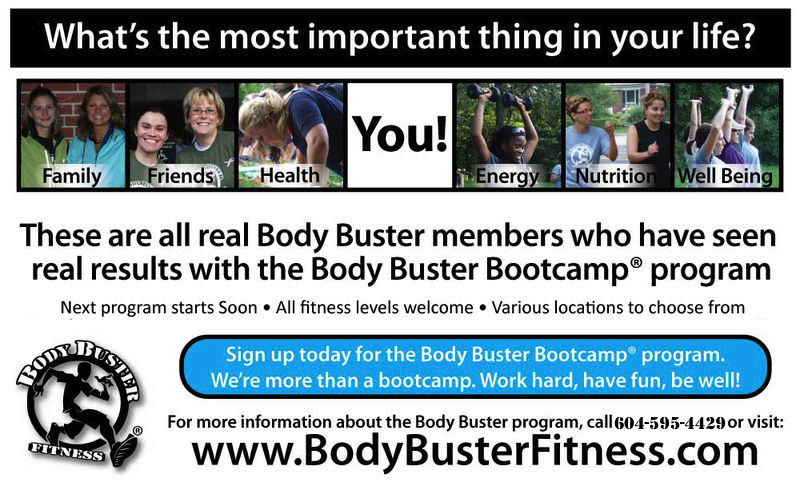 Week 3 is now underway and registrations are already coming in for our upcoming July 1st and 2nd Body Buster Program! As you know this is a busy time of year and we encourage you to register right away to ensure you will receive your desired program package before options sell out. 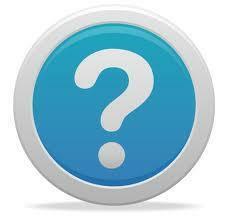 Are you going on vacation or camping over the Summer? Still want to make a few classes but can't commit to a full program? Body Buster Fitness provides EXTRA FLEXIBILITY over July and August to work around your busy schedule! Don't lose what you've worked so hard for! Like personal training in a group setting, South Surrey & Langley Body Buster instructors get to know YOU and YOUR goals. Body Buster offers the one of a kind...(and complimentary!) Member's Guide, making it so much more than your typical bootcamp! Improving not only your fitness but your overall well-being. July 1st and 2nd mark the start of the Next 4 Week Body Buster Program! We are excited to be offering classes in both South Surrey and Langley. With class times in the morning and evening 5 days a week, the Body Buster Program fits even the busiest of schedules! Can't attend a class? No problem! Make it up on a different day or time. Our one of a kind system makes it easy to take advantage of make up classes, just one of the MANY Body Buster perks! Register by June 21st at 11:59pm and receive a FREE Body Buster Gift! EARLY BIRD SIGN UP GIFT! REGISTER for the JULY 1ST PROGRAM BEFORE THE END OF THIS PROGRAM AND RECEIVE A FREE BODY BUSTER GIFT! What will it be this time!? Body Buster Fitness Bootcamp is the perfect excuse to get outdoors! Rain or shine - the most fun way to work out is outdoors and with a group of great people, fun and supportive instructors, dynamic terrain and equipment! This combination creates the Body Buster Program that helps push you to achieve your personal best! (Our classes are in the early mornings, or later evenings - so you're not working out in the middle of the afternoon heat).